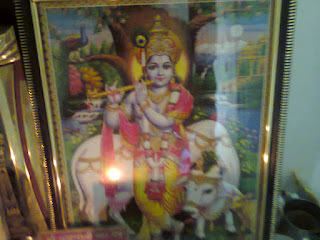 Krishna Ashtakam is a worshipping prayer rendered to Lord Sri Krishna praising his valor and glory. These slokas are recited while doing the daily puja that is being done at homes mostly by Hindus in the morning time. Ashtakam means a prayer which contains eight hymns or slokas. Each hymn or verse is composed of four phrases each describing one quality or great acts of Sri Krishna. And, each sloka is composed of two lines. 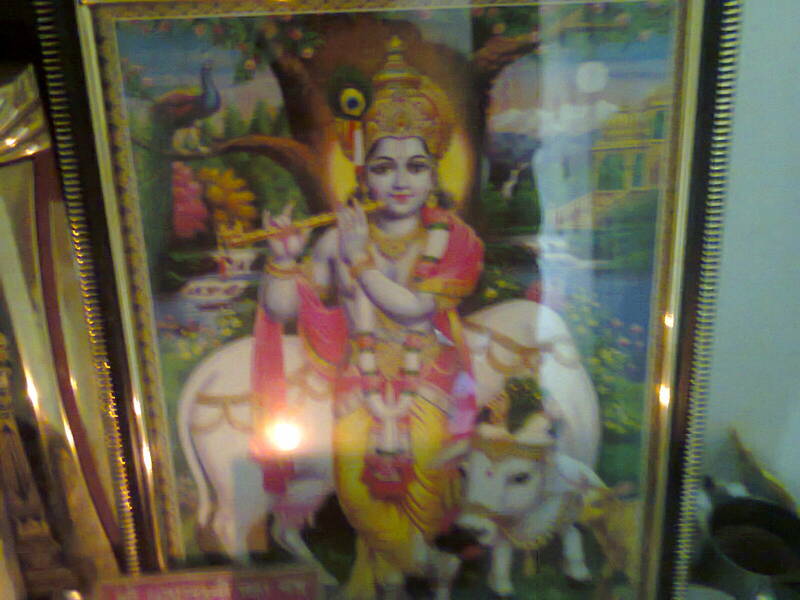 It is believed that Krishna ashtakam lyrics possess great powers. You may recite them generally also without sitting at any worship place, during any time of the day, to find some relief and solutions from your tensions. I pay my reverence to Sri Krishna who is the son of Vasudeva and killer of demons Kamsa and Chaanura, and who is the immeasurable happiness for mother Devaki and is the teacher for the whole universe. I bow to Sri Krishna whose color is like atasi Pushpa and who is glowing with decorated garlands, silver anklets, jewel embedded wristbands, and bracelets. dharam = one wearing them. I pay respects to Sri Krishna who is having curled hair, whose face glows like full moon and who is wearing pleasant and playful earrings. mandaara = a flower named mandaar (hibiscus), gandha = smell, samyuktam = accompanied, charuhaasam = pleasant smile, chaturbhujam = four shouldered, barhi pincha = peacock feather, choodaangam = possessed in the hair of the head. I bow to Sri Krishna who smells with hibiscus fragrance, who smiles pleasingly, who is having four shoulders and wearing a peacock feather in his head. utphulla = widened, padma patra = lotus leaves, aksham = eyed, neela = blue, jeemoota = water laden clouds, sannibham = resembling glowed, yadavaanaam = among yadav community, shiro ratnam = crest jewel or supreme. I bow to Sri Krishna, whose eyes resemble wide blown lotus petals or lotus leaves, whose body shines like the dark blue water laden clouds and who is the crest jewel or chief of yadava clan. I bow my head to Sri Krishna who is making his appearance in a gloriously shining wear of pitambaram and boundless fragrance of tulasi along with his consort Rukmini in a sportive mood. gopikaanaam = because of gopikas ( the cowherd girls who have been pious devotees of Sri Krishna), kuchadwandva = both breasts of Sri Krishna, kumkuma Ankita = spread with kumkum (a red coloured substance used for worship of God), vakshasam = hearted, sriniketam = abode of Sri or Lakshmi, Mahesh vaasam = who is Shiva's life. I pay my respects to Sri Krishna whose chest is smeared with the kumkum used by gopis in worshipping Him, who is the abode for Lakshmi and who is the life for Shiva. I bow to Sri Krishna who has the birthmark of srivatsa on his chest and is adorned with a garland of flowers on his broad chest and who holds the divine conch and wheel in his hands. krishnashtakam = eight verses or slokas of Krishna, idam punyam = it provides good benefits or results, pratarutthaaya = early morning, Pathet = if recited, Koti janma = one crore births, krutam = done, paapam = evil deeds or sins, smaranena = even by thinking, vinashyati = gets destroyed. If you recite these krishnashtakam lyrics early in the morning, or even by a simple remembrance of these slokas in mind, sins done even in one crore lives will get destroyed ( and you will attain moksha).